Just one example of the devastation caused by hurricane Maria, shown on Sept. 25, 2017. Nearly one week after hurricane Maria devastated the island of Puerto Rico, residents are still trying to get the basics of food, water, gas, and money from banks. Much of the damage done was to electrical wires, fallen trees, and flattened vegetation, in addition to home wooden roofs torn off. Puerto Rico's population, already down more than 10 percent in the last decade, will likely fall below 3 million over the next few years, from its peak of 3.8 million in 2000, and "much deeper population declines" are possible in the future as islanders left destitute by Hurricane Maria and the weak economy move to Florida, New York, and other states, writes Matt Fabian. Fabian has studied Puerto Rico and its fiscal and government challenges over the past several years as publisher of the Connecticut-based Municipal Market Analytics daily letter. "The combination of tens of thousands of destroyed homes, 94 degree heat and humidity, persistent rain, an exploding post-flood mosquito population, no water or air-conditioning, closed hospitals, wrecked bridges, mud slides, etc., equate to misery for Puerto Ricans at present," Fabian wrote of the U.S. colony. 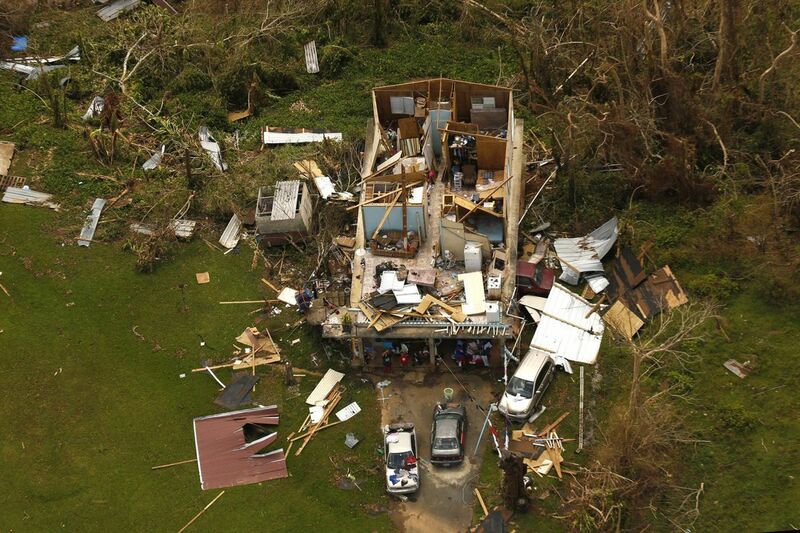 With isolated towns and neighborhoods lacking fresh water or medical care six days after Maria hit, the death count — 13 on the island so far, with more in the neighboring U.S. Virgin Islands and nearby British, French, and Dutch colonies — "is sure to rise." The island remains without electric power service; fresh water is limited to about 25 percent of the population with old-fashioned gravity-fed water from the PRASA water utility, but electric pumps that supply most towns and neighborhoods are out of service. "There is no commercial airline service, limited telecommunications capacity, and major disruptions to island health care." The U.S. drug and chemical factories that help power Puerto Rico's undersized economy have been shut at least until workers can shelter their families and safely return. FEMA and the U.S. military are flying in temporary supplies, "but it appears likely that mass evacuations will be required in the near term" to keep disease from spreading. And many of those leaving will stay off the island for years, Fabian adds, because that's how long it will take to restore full utilities and habitability to the island's towns, let alone employment. There will be a near-time boom in cleanup, stabilization, and reconstruction work, but not enough to offset the expected drop in normal economic activity, or keep those who lack incomes and shelter from leaving the island if they can find places on the mainland to go. Puerto Rico's major Aguirre power station wasn't flooded; others were, and with power lines down even those that can be restarted won't be powering homes or businesses until the lines are rebuilt. FEMA, Department of Energy, and New York State power crews are on the way to help (crews in nearby Florida are busy handling the peninsula's recent storm damage). The need for rebuilding will likely speed a sale to private owners of the island's PREPA public power utility, Fabian writes. While many structures were smashed, the decline in population "implies that the island contained excess housing and other infrastructure," so not everything wrecked needs to be replaced. In any event, a lot of properties weren't insured. In his brief social-media comments, President Trump has brought up the Puerto Rico government's effective bankruptcy. But the storm damage "is massive enough to set aside creditor/debtor considerations for months and potentially longer," Fabian writes. Bondholder litigation under the PROMESA federal oversight board has already been halted in recognition of the disaster. Investors who hold around $100 billion in low-rated Puerto Rico government and government-run utility debt can assume that, "with an apparent breakdown of much in the way of governmental operations, there will be zero payments to most PR bondholders for the foreseeable future." If the hedge funds that have speculated on low-rated Puerto Rico bonds have a problem with that, "Federal courts will reasonably show little empathy for mainland financial creditors" compared to local governments, retirees, and island-based "stakeholders" after Maria, Fabian adds. Any changes in bond payments will likely be "to the benefit of the commonwealth, not its creditors. The storm could also make Congress more amenable" to financing Puerto Rico recovery, but that's not likely to extend to existing bonds. The PROMESA board "has already allowed the commonwealth to divert $1B of fiscal plan resources to recovery costs. More radical, downward adjustments" are "extremely likely. These will not be kind to bondholders." Maybe Puerto Rico will follow Detroit's lead in offering hedge funds and other bondholders "redevelopment rights in exchange" for cutting existing bond repayments, Fabian concludes. "At a minimum, existing bondholders may now be more unilaterally willing to accept up-front defaults and payment delays in exchange for a greater share of (insurance-fueled) future growth." He's not predicting whether that will prove profitable for the investors. Puerto Rico will rebuild, in time.